The son of the former Nova Corpsman Jesse Alexander, Sam Alexander was chosen to join the intergalactic police force by the Guardians of the Galaxy. He was? Why? Why are they in charge of picking new Nova Corps members? Eh, whatever. Sam Alexander is a Marvel NOW! introduction, but has already been adapted into cartoons and videogames. His costume is darker than the ones worn by previous Novae, but the pattern is mostly the same: three stars on the chest, pointy shoulders, gold belt, boots and gloves, etc. Just darker. Especially his helmet, which is black instead of gold. Why is it black? Because Sam's dad was a member of the Supernovas, the Nova Corps' black ops squad. If you don't like the modern helmet, the set includes a gold version - no, he hasn't worn a gold one in the comics, but he does wear one in the Ultimate Spider-Man cartoon (which may also explain why this figure is sold with Venom). If you remove the helmet, you can replace it with shaggy black hair to make an unmasked Sam Alexander. And if that weren't enough, we also get a second head and hair, to make Sam's dad Jesse! He's older and has some stubble, so there's no mistaking them. Finally, we get a blue "waist blast" piece, so you can make the Alexander boys fly. When Spider-Man rejected the alien symbiote costume he wore for a while, it found a new partner in Eddie Brock, Peter Parker's sworn enemy. Together, they fought Spider-Man (and protected the innocent) as the vigilante Venom. 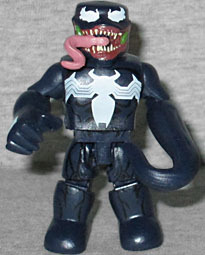 This figure is functionally identical to Venom Unleashed (aka "Erik Larsen Venom") from the Venom Through the Ages box set - the big add-on muscles, the duckface, and even the arm tendril. The only difference is that this one doesn't have blue muscles painted on the front - his entire body is an inky blue with black detailing. Well, there is one other difference, deep down inside. If you remove the head cap, remove the "powerhouse" chest, remove the gloves and the biceps pieces, remove the waist, remove the thigh padding and the big boots, and you'll find a plain, skinny Venom (or at least a black-suited Spider-Man) underneath. The set even includes extra bodyparts to complete his transformation to full-on skinniness. 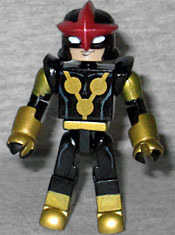 This same Nova was available in Series 51, but he didn't come with the alternate helmet, he didn't come with the alternate head, and he didn't come with the flight blast. Obviously, this one is better. And Venom is nice enough, if you don't have one of the previous releases. This entry was posted in Art Asylum, Marvel, MMMR and tagged Guardians of the Galaxy, Minimates, Spider-Man. Bookmark the permalink.